You can make a difference in the lives of your neighbors with an Arizona Tax Credit donation to Benevilla. The Arizona Charitable Tax Credit provides a dollar-for-dollar credit to your AZ Tax Bill. INDIVIDUALS can make a donation up to $400 and COUPLES filing jointly can make a donation up to $800. Benevilla is a Qualified Charitable Organization for Your Arizona Charitable Tax Credit. 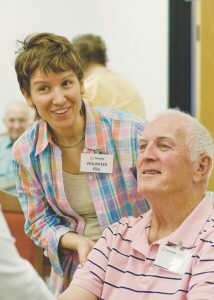 Benevilla will use your gift to underwrite essential services for older adults, adults with disabilities, children and the families who care for them who rely on our community’s collective generosity. How does Benevilla utilize the Charitable Tax Credit dollars? 100% of your tax credit dollars help strengthen communities by offering supportive, life enriching programs such as free caregiver support groups and volunteer home services, that enable personal independence and dignity. Please don’t let your tax credit go to waste! Can I claim this tax credit and still donate to the school tax credit programs? YES! The programs are separate tax credits. Beginning with the 2016 tax year, credit eligible contributions made to a Qualifying Charitable Organization that are made on or before Arizona’s April Tax Day may be applied to either the current or the preceding taxable year. Your donation will be considered to have been made on the last day of that taxable year. With your help, we can enrich lives, grow community, and bring generations together. Thank you for your generosity! Please fill out the form and click the Donate With PayPal button and you will be directed to PayPal to complete your online donation.